“All that Territory or tract of ground, situate, lying, and being within our Dominions in America, extending from the North end of the Island called Luck Island, which lies in the Southern Virginia Seas and within six and Thirty degrees of the Northern Latitude, and to the West as far as the South Seas; and so Southerly as far as the River Saint Mathias, which borders upon the Coast of Florida, and within one and Thirty degrees of Northern Latitude, and West in a direct Line as far as the South Seas aforesaid; Together with all and singular Ports, Harbours, Bays, Rivers, Isles, and Islets (A Declaration 1663,. Avalon Project). With charter in hand, in 1670 the Barbados proprietors established Carolina colony. In 1712, Carolina split into two colonies, north, and south Carolina. Later, in 1733, James Ogelthorpe settled Georgia colony with a charter from King George the II to the land between the Savannah and Altamaha rivers. The Low Country landscape merges into the rolling hills of the Piedmont, also called Up Country, gentler in the east and more hilly to the west and northwest. There the land rises gradually from the southeast to the northwest to become one with the Appalachian Mountains. Low Country includes 79 barrier islands or “Sea Islands” along the coast that continues all the way to the St. John River in northeast Florida. 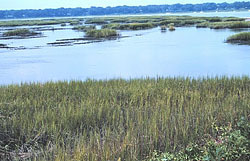 Wetlands along the Beaufort River. 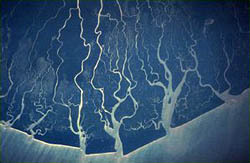 Rivers and tidewater streams lace the coastal plain creating widespread wetland landscapes. For Africans arriving in the Low Country, the climate and the wetlands, rivers and winding streams, if not the pine forests, must have seemed familiar, reminiscent of the landscapes they left behind in the wetlands of West or West Central Africa. Those European settlers that had not lived in the West Indies came from landscapes with climates quite different from the hot, humid Low Country. Climate greatly affected the peopling and economic development of the region. Huguenots and other persecuted Protestants emigrated to South Carolina Colony. The people settled the Low Country Region of Carolina and Georgia were of diverse national, social, and religious origins. 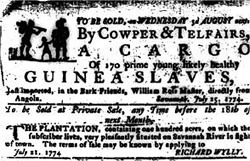 Two factors influenced the immigration of diverse European groups to South Carolina: The Constitution of South Carolina guaranteed religious freedom and the Colleton advertisements reached out to landless people like indentured servants completing their terms of indenture urging them to immigrate to South Carolina. Religious freedom attracted persecuted groups like the Huguenots and Sephardic Jews. 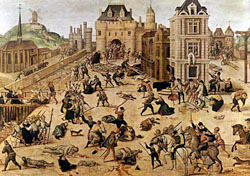 After 1685, when Louis XIV revoked the 87-year-old Edict of Nantes, a law that had given Protestants religious freedom, many Huguenots emigrated to the British mainland colonies. Sephardic Jews migrated to the city in such numbers that Charleston became one of the largest Jewish communities in North America. The Jewish Coming Street Cemetery, first established in 1762 attests to their long-standing presence in the community. The Colleton Advertisements targeting landless people attracted Scots, Irish, and Scots-Irish. However, from the beginning of the colony English Anglicans predominated among the European population. Also from the very earliest years of the colony, 20 to 30% of the settlers were Africans of diverse ethnic origins. During the first twenty-five years, about one in every four settlers was African. By 1720, Africans had outnumbered the Europeans for more than a decade. South Carolina was the one British colony in North America in which settlement and African slavery went hand in hand. After 1750, the government encouraged white Protestant settlement in townships in the interior and migration from Pennsylvania, Virginia, and North Carolina were to give the upcountry a different character: smaller farms and a larger percentage of German, Scotch-Irish, and Welsh settlers. In the early days of the republic, up country European populations temporarily gave the total population a white majority, but the spread of cotton plantations soon again made African American slaves the majority. African slave labor was considered essential to Carolina economic success, in no small part because of the climate (Wood 1974; South Carolina 2004a). 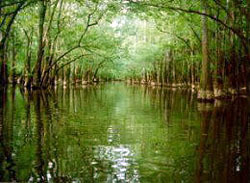 Inland swampland in South Carolina. The Carolina landscape and climate that lent itself to rice cultivation also created an environment with a reputation for “ill health,” people living there suffered “fevers and ague (sharp chills).” The symptoms of “fevers and ague” included severe headaches, fatigue, and sometimes total loss of strength. Early on, those wealthy planters who could often moved with their families to the north during summer and fall, the seasons when fevers were most prevalent in South Carolina (Wood 1974:70–73). Other planters were absentee landlords, leaving the Africans and overseers to the seasonal “thunder and lightening, and muskatoes [sic] and sand flies in abundance” that Eliza Pinckney complained of in her letter book describing her life on an 18th century low country plantation (Pinckney 1972:40). On the other hand, South Carolina planters observed that some Africans seemed to be resistant to fevers. Enslaved Africans were however equally susceptible to other diseases. Eighteenth century doctors observed that “Whites, Blacks, and Indians” had more or less equal illness and death from small pox. Africans were highly susceptible to respiratory illnesses and American Indians generally had little immunity or resistance to European diseases. The combined impact of the wetland environment and sickness or death from illnesses made for a constant drain on the people, European, American Indian, or African, available to develop the Low Country economy (Wood 1974:87–91). Over 40% of the Africans reaching the British colonies before the American Revolution passed through South Carolina. Almost all of these enslaved people entered the Charleston port. After a brief quarantined on Sullivan’s Island they were sold in Charlestown, later called Charleston, slave markets. Many of these enslaved people were almost immediately put to work in South Carolina’s rice fields. Writers of the period remarked that there was no harder, or more unhealthy, work possible. In fact, colonial travelers described the Carolina rice fields as charnel houses for enslaved African-Americans (Wood 1974; Morgan 1998). The majority of Africans enslaved during the colonial period lived in the Carolina and Georgia Low Country. In spite of the high death toll, a fortuitous combination of geographic and demographic factors, allowed these enslaved African peoples to shape their daily lives and customs according to African cultural traditions and to produce new African American cultural patterns. The English enslaved American Indians for labor whenever they could. Enslavement of Indians continued for a hundred years following English settlement of the North American mainland, but never in great numbers. For the English, along with fear of Indian reprisals for enslavement, there was an added economic incentive to curtail their limited reliance on Indians for labor. In the 17th century, peaceful trade in deerskins with the Indians provided the English with the colony’s first source of direct revenue with England. The risks of revenue loss to the Carolinians far outweighed the benefits they might gain from of Indian enslavement. The solution was to import Africans for labor, a solution that did not always work to the advantage of the English. Africans and Indians intermarried, formed alliances, and shared many experiences in 18th century Low Country. Sale of Africans from Angola, Georgia 1774. The Africans brought to Low Country were also of diverse ethnic origins. Kongos and Angolas dominated the first wave of Africans enslaved. In the 17th and early part of the 18th century the preponderance of people imported directly from Africa to the Low Country were from the Kongo and Angola (Donnan 1935; Curtin 1969; Wood 1974:340–341; Eltis 2002;). Wood’s analysis of data regarding the origin of ships delivering Africans to Charlestown, South Carolina from March 1735 – March 1740 found 70% of Africans arrived on ships from Angola. These Africans enslaved in 17th century South Carolina spent most of their time clearing land, cutting wood, cultivating subsistence crops, and raising livestock for export to support the colonial economy. As early as 1670, there is evidence of absentee investors depending on Africans to develop and maintain herds of cattle in South Carolina. Wood conjectures that the American term “cowboy” originated from the colonial period when African men living at cowpens had herding responsibilities (Wood 1974:31 fn 58). An economy based on livestock was not the ultimate goal of South Carolina proprietors. Its advantage was that it freed African workers to carry out the necessary labor of a frontier society to build settlements and keep the settlers from starving. Morgan argues, this first wave of Africans had more freedom to shape their culture than in any other part of the North American mainland (Morgan 1998:19). Not only did they live in autonomous units, in society as a whole, they made up a significantly large proportion of the population. As the 18th century opened Africans in South Carolina numbered 2,444, making up 75% of the total population. Within thirty years, there were 20,000 Africans, out-numbering Europeans 2:1. This was still the case in 1740. Most, but not all, of these Africans were Kongos and Angolas (Adams and Barnwell 2002). The dominance of the Kongo and Angola population declined after twenty Angolan men led the 1739 Stono Rebellion. After the Rebellion, the South Carolina legislature levied a prohibitive tax on people imported directly from Africa forcing the rate of importation down to a trickle for the next decade. Windward Coast Africans: Indigo and Rice Cultivators dominated the second wave of people imported into Low Country after 1750. Most scholars now believe that much of the technology involved in rice cultivation along coastal South Carolina and Georgia, originated in rice-producing regions in West Africa, and was transferred across the Atlantic by slaves. Early accounts of Africans in South Carolina indicate the bondsmen produced their own subsistence crops and that the French and English had no prior rice-farming knowledge. In contrast to Europeans, Africans from the West coast of Africa were widely familiar with rice planting. According to Wood, “Ancient speakers of a proto-Bantu language in the sub Sahara region are known to have cultivated the crop. By the 17th and 18th centuries, West Africans were selling rice to slave traders to provision their ships. The northernmost English factory on the coast, James fort in the Gambia, was in a region where rice was grown in paddies along the riverbanks. In the Congo-Angola region, which was the southernmost area of call for English slavers, a white explorer once noted rice to be so plentiful it brought almost no price. However, the most significant rice region, Wood continues, was the Windward Coast, the area upwind or westward from the major Gold Coast trading station of Elmina in present day Ghana” (Wood 1974:59). Newspaper announcing forthcoming sale of Africans from the Windward Coast; stress their knowledge of rice culture. The plantation owners purchased slaves from various parts of Africa, but they greatly preferred slaves from what they called the “Rice Coast” or “Windward Coast”—the traditional rice-growing region of West Africa, stretching from Senegal down to Sierra Leone and Liberia. The plantation owners were willing to pay higher prices for slaves from this area, and Africans from the Rice Coast were almost certainly the largest group of slaves imported into South Carolina and Georgia during the 18th century (Creel 1988:29–37; Littlefield 1981:34–36; Curtin 1969; Donnan 1935). 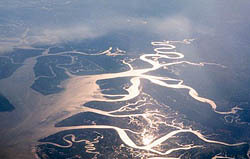 Judith Carney, a geographer, draws spatial connections between the Americas, especially low country South Carolina and the Upper Guinea Coast—that part of the West African coast stretching from present-day Senegal to Liberia, encompassing three slave trading regions, Senegambia, the Windward Coast, and Sierra Leone where rice cultivation flourished. Carney makes the case that Africans introduced sophisticated soil and water management techniques to low country South Carolina. For tidal rice cultivation, an elaborate system of irrigation works—levees, ditches, culverts, floodgates, and drains—had to be constructed (and maintained) to control and regulate the flow of water onto and off of the fields. Carney explains that this agricultural technology and the hollow cypress logs known as “trunks” or “plugs,” used to control water flow in embankments, were African innovations in low country rice cultivation. Likewise, Carney documents that the red-colored rice found in early South Carolina, was probably Oryza glaberrima, an African, not an Asian, variety (Carney 2001:78–98) Learn more about the rice plantation economy in South Carolina and slavery. In the ten years following the Stono Rebellion, the colony developed indigo as a second cash crop. Indigo, like rice, was labor intensive and its cultivation and processing for trade was well also known to Africans from the Windward Coast. With both indigo and rice production depending upon importation of Africans skilled in their cultivation and processing, economics won out over fear of slave rebellion. 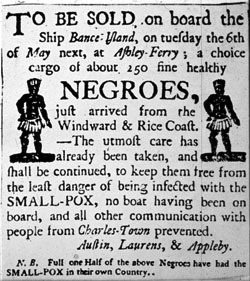 In 1750, the South Carolina legislature repealed the tax on importation of Africans into the colony, ending a ten-year moratorium and importation of Africans resumed. Comparison of population of Europeans and enslaved Africans, South Carolina 1700–1790. According to Carney during the critical decades that tidewater rice cultivation developed, the share of Africans brought to South Carolina from the rice cultivation areas of Senegal, Gambia, and Sierra Leone grew from 12% in the 1730s to 54% between 1749–1765 and rose to 64% by 1774. Over 58,000 Africans entered South Carolina in the twenty-five years from 1750 and 1775 making South Carolina the largest direct importer of Africans for enslavement on the North American mainland. The majority of these people were from Senagambia and Sierra Leone (Carney 2001:89). By the time the American Revolution got underway, Senagambians and people from Sierra Leone formed the majority of the enslaved Africans in South Carolina (Carney 2001:89). In fact, from 1710 to the end of the colonial period more Africans lived in South Carolina than Europeans. In the first half of the century, Kongos and Angolas predominated. In the second half of the century, Africans from Senagambia and Sierra Leone predominated. Low Country rice cultivation areas. From the mid 18th century on, rice production was steadily shifting from inland swamp to the even higher yielding tidal river floodplains of South Carolina. The large number of enslaved people imported directly from the rice growing area of West Africa who possessed the knowledge of the crop’s cultivation was critical to this transition. Over time, descendants of these early generations of Africans came to be known as the Gullah-Geechee people who had and continue to have distinctive cultural characteristics and a shared heritage. In the same year as the Stono Rebellion, Eliza Lucas Pinckney introduced indigo plants to South Carolina. Eliza Lucas, daughter of a wealthy Antiguan planter, later married Colonel Charles Pinckney, a member of South Carolina’s landed gentry. History does not record the help she must have received from enslaved West Africans skilled in the cultivation of indigo plants and production of indigo dye (Pinckney 1977). Indigo was an important part of the internal West African economy. The Baule people of Sierra Leone cultivated indigo, produced indigo dye, made, and traded indigo-dyed textiles before and during the forced migration of Africans for enslavement on the British North American mainland. People from the area of the Bight of Benin are known to have traded indigo-dyed cloth with North Africa since the 14th century (Olanyin 1985; Davidson 1987). By 1747, Pinckney and her anonymous African workforce, after many trials, managed to produce enough indigo to make up a shipment for England. It met with approval in England and remained one of the two staple crops of the colony from the late 1740s until the Revolutionary War. Sea Islands home of Gullah-Geechee People and their Cultural Heritage. The early generation of people from the Kongo and Angola shared many aspects of Kongo culture, language, and customs. The Senegambians and Sierra Leone people arriving in the eighteenth century, shared Mandekan language, Mande culture, and customs. This multicultural group of Africans and their descendant generations lived together, mostly on plantations and, in comparison to African people in the Chesapeake, lived in relative isolation from Europeans. Moreover, there was very little racial admixture between them and Europeans. Twenty-first century genetic analysis confirms previous cultural studies indicating a very limited European influence on the Gullah-speaking African Americans. Cultural evidence, anthropometric, serologic studies, and now genetic studies, have all indicated a lower European genetic contribution to the Gullah Sea Islanders than to other African American populations in the United States (Parra 2001). Living in semi-autonomous isolation from Europeans not only limited European genetic admixture among Low Country Africans but also served to limit their acculturation to Euro-American customs and foster preservation of African cultural features. This is especially true for features that are prone to resist change, namely African systems of meaning expressed in language, cosmological beliefs, religious ceremonies, funerary and burial practices, music, other expressive cultural forms, foodways, and selected material cultural features. Over time, the descendants of the early South Carolina Kongo and Angola Africans merged with the people from Senegambia and Sierra Leone as they formed family, kin networks and community. Their African languages and English melded into a distinctive African American language called Gullah or, in Georgia, Geechee. By these names, the people and their cultural heritage came to be known. Learn more about Gullah-Geechee people.